Well I fitted the rear wheels as intended but as I rotated them back and forth I noticed a significant clunk each time I reversed the direction of the wheel I was working with at the time. Thinking that the replacement axle was in fact junk I started to strip it all out again and was intending to refit the original axle. I was pretty upset about this and wasn’t really thinking it through. I also went off and ordered a new pinion oil seal to fit in the old axle. Anyway after I got a good way through the removal process I realised that the clunk was actually coming from the gear box and not the axle. So I had to tighten everything back up again. 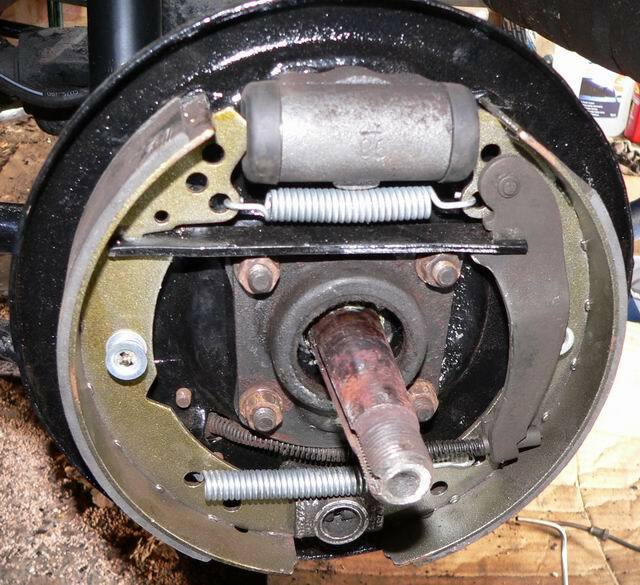 I adjusted the brake shoes so they are close to the drums. The car is now sitting on all four wheels again, something it has not done in over a year. Things still left to do include, tightening propshaft bolts to gear box flange, centre carrier bolts tightening, starter motor bolts, new exhaust, finish alternator conversion and associated rewiring and then refit the manifold. Doesn’t sound too much when you say it quickly now does it? Trying to ignore the drip from the gear box where I replaced the oil seal on the output shaft, ho hum. I fitted the rear brake backing plates with the new gaskets. I just cleaned up the seal carriers and used them as is for the moment. I then connected up the brake pipe to the rear brakes and removed the clamp that had been on the flexible pipe for about 18 months. I left the joints loose for a week and found brake fluid oozing out when I went back to it today. For good measure I bled the rear brakes out with fresh fluid so they should be good to go now. Unfortunately the dripping brake fluid has taken some of the paint off so I’ll have to touch that up soon but otherwise I am about ready to refit the rear wheels at least long enough to tighten the castle nut on the axle end and then adjust the brake shoes so that they will be close to the inside of the drum as they should be. When disassembling the axle one of the torque rod bolts was very stuck and I used a blow torch on it. This slightly burned the rubber piece that locates the lower spring mount. I bought a pair of these rubber pieces on eBay and replaced the burned one today as well. I jacked the axle up and then put spring clamps on the spring, then lowering the axle again took the pressure off the mount enough to change it over. This was all a bit nerve wracking as I don’t like working with suspension springs under tension but went OK in the end. Yesterday I assembled the rear brakes as can be seen above. 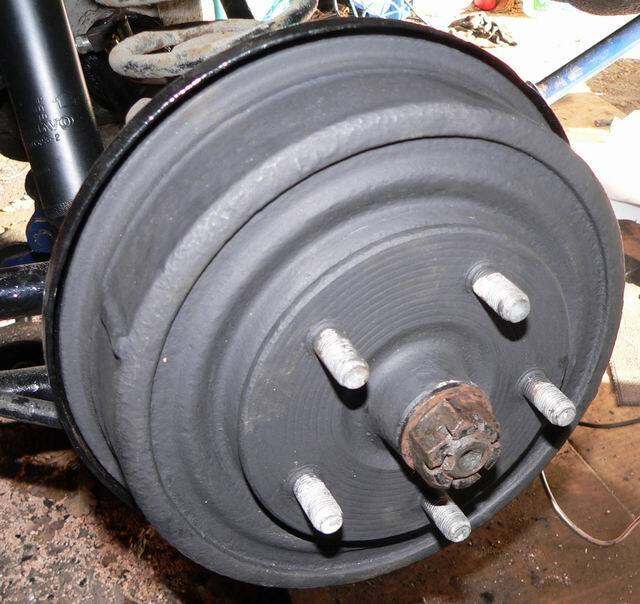 My attempts at reassembling brake shoes on other cars had led me to dread this operation but having read the Volvo service manual it turned out to be quite easy after all. I also read the instructions on creating double flares which turned out to be quite simple if a little fiddly. So I made the brake lines for each side of the rear axle but left the fitting for today. Well the fitting of the new brake lines did not go well at all. The near side line, which is the shorter of the two, seemed to go OK and made me feel as if the job would be not too hard but the problems started with the offside line. First of all the junction block is very close to the differential meaning that the brake line has to bend up very close to the fitting which is not easy to do. Then as I was tightening the fitting into the brake cylinder it stripped the threads. This end of the line bent sharply close to the fitting and by the time I had cut off the flare I could not get the flaring tool and the fitting in the space so that meant making a new line during which I managed to forget to put the fitting on one end of the line before I made the flare. Fortunately I managed to cut the flare off leaving enough space this time for the fitting and flare tool. As I was fitting this second new line I noticed that there was a copper colour in the bottom of the brake cylinder hole. When I removed the old line it had sheared off the flare which meant the new line did not seat properly which was why it stripped the threads. So off came the hub again and I removed the cylinder from the backing plate and then I could dig out the flare and then put it all back together again. This time the fitting tightened up OK. Having been filled anew with confidence I decided to tackle the lines from the engine bay to the rear. I managed to reuse most of the junked rear line for the connection from the engine bay junction block to the proportioning valve without any major problems. Finally, or so I thought, I started work on the long line from the proportioning valve to the rear flexible hose. This also went relatively smoothly. Then I noticed brake fluid dripping from the off side of the rear junction block so I attempted to tighten the fitting and managed the strip the threads. So I cut the flare off, removed the stripped fitting and made a new flare, then cut that flare off, put a new fitting on and then made another flare. This was particularly galling as I did not want to disturb the brake cylinder end of the line so I did it in situ which makes a fiddly job even worse. I was still not happy with the seating of the lines in the junction block and after removal and carful checking it seems that I should have been using a shorter fitting without a lead in to connect to the junction block to get more threads in contact. I put the fittings I had in and tightened them gingerly to hold it for now and then went and ordered the correct parts. I attempted to fit a modified bracket to convert to a brake light switch that works on pedal movement instead of the hydraulic pressure as at present. I thought I had it all in and lined up OK before I realised I had put it onto the clutch pedal instead of the brake pedal. So now I’m going to have to go and get some sheet steel and make a new bracket that will reach across to the brake pedal. Oh well you can’t win them all. I should have mentioned that I fitted new ducting to the defroster vents from the heater box a couple of weeks ago. That is a big improvement over the old rotted or aluminium or just missing ones that were there previously. We picked up Olaf from the welder yesterday. It had even passed the MOT. I drove it home which was a bit nerve wracking as it was dark and in London and I had never driven an 1800 before. My ability to see out was somewhat impaired by the collapsed seat which didn’t help. I will be renovating the seat supports as a matter of urgency I think. Both the tachometer and the speedometer seemed to be working and reading reasonable values which is good as I thought at least the tachometer was not working previously. Unfortunately the fuel gauge did not register the petrol that I put in and I thought I had checked that out already. In the preparation for the MOT some lights were fixed, the rear brakes were done as the linings had come adrift on one side. Then the spark plugs got fouled just before I picked it up. The mechanic did a quick tune up on the carburettors as they were very rich and fitted new plugs. Yippee! The rust, while extensive is not terminal. Now all I have to do is wait a couple of weeks and raid the savings account at the end of it. He will also give it a once over to see what else may need doing for the MOT. I must have done something right with the engine as he was impressed with how easily it starts. Ebay is an insidious place, I have been buying various manuals as well as a genuine Girling brake booster. There is a replacement Lockheed one fitted at the moment. Brookhouse Volvo rang this morning to say that the lower radiator hose complete with pipe to oil cooler, heater valve and heater drain had all arrived and would ship today. Unfortunately I don’t expect them to arrive before Monday, so I can’t fit them this weekend. I phoned Automec about the kunifer only to find out that it wasn’t in stock and wouldn’t be in until the middle of next week so I asked them to send the connector and some ‘P’ clips and cancelled the kunifer order. I then ordered the kunifer and some other bits from Frost, also unlikely to arrive before Monday now. I should still have enough work to do over the weekend to keep me busy, but I was hoping to finish the cooling system and get the fuel pipe in place. Naturally I have now discovered the kunifer, clips and connector I ordered from Automec are all wrong, I am still trying to determine exactly what I need, the 15mm spanner to undo it appears to be a complete red herring as I now believe it may be an imperial sized fitting. As you can see from the image above, the connector and stub of hard line are in a pretty poor state and that’s my excuse for not being able to easily determine what it is. Talked to Brookhouse about the two radiator hoses yesterday, apparently the upper hose just needs cutting down. The suppliers have started to supply the same hose for the B20 and B18 engines, and the B20 takes a longer hose, so B18 owners have to cut it down. The lower hose went back and will be replaced with the correct one to connect to the oil cooler. The heater valve is due in this country imminently and will be sent on. I asked for a heater unit drain hose as well. A discussion on the 1800list has highlighted the fact that I am missing a plastic ‘scuttle’ from the fresh air intake and I was slightly miffed that one came up on Ebay but sold within a matter of hours before I could get to it. Looking at other pictures of 1800s on the net, it looks like the vacuum servo brake unit I have is not an original part but as I am not going for a completely stock rebuild it can stay as it is for now. If I come across the correct one at some point I may replace it as it does mildly irritate me.